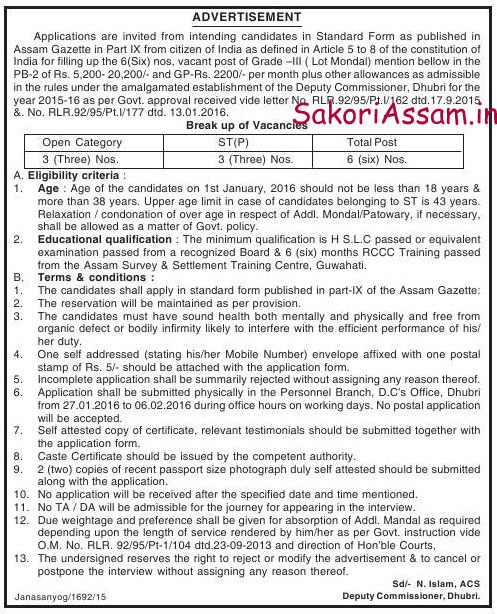 month plus other allowances as admissible in the rules under amalgamated establishment of the Deputy Commissioner, Dhubri for the year 2015-16 as per Govt. approval received vide letter No. RLR.92/95/Pt.1/162 dtd. 17.09.2015 &No. RLR.92/95/Pt.1/177 dtd. 13.01.2016. Educational Qualification: The minimum qualification is H.S.L.C passed or equivalent examination passed from a recognized Board & 6 (six) months RCCC Training passed from the Assam Survey & Settlement Training Centre, Guwahati. One self addressed (stating his/her Mobile Number) envelope affixed with one postal stamp of Rs.5/- should be attached with the application form. Application shall be submitted physically in the Personal Branch, D.C’s Office, Dhubri from 27/01/2016 to 06/01/2016 during offices hours on working days. No postal application will be accepted. Self attested copy of certificate, relevant testimonials should submitted together with the application form. 2 (two) copies of recent passport size photograph duly self attested should be submitted along with the application.